The accuracy is absolutely perfect, precise even. I’ve ran two 5K routes where I know exactly the half way point, and Nike+ was bang on. When I got back, it was instantly on my iPhone NRC App, with full route from first step to last. No gaps, nothing. 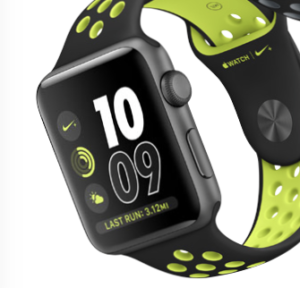 What’s perhaps most interesting about Apple Watch Nike+ is that, at its heart, it’s just a regular, old Apple Watch. Those bright, perforated bands are removable by pressing a button on the back of the watch and sliding them out, sideways (not to mention the fact that there are more muted options than the yellow version I got). And if you buy the standard version of the Watch, you can always download and install the Nike app – though you’ll be missing the company’s custom faces with integrated Nike swoosh and some shortcuts. Not real relevant for me since I always run with both my watch and my iPhone (until someone comes up with a plausible standalone podcast player for the watch). I’ve had big problems getting the watch and iPhone versions of various apps to talk to each other, which finally prompted me to switch from Runkeeper to RunTastic. I personally think the black Nike+ band that is shown in all the product shots looks pretty good. Not sure how well the faces would work out, but it seems not an unreasonable idea to buy the Nike+ edition just to have the option–it can basically become a regular Sports watch anytime, and it’s the same price. Aluminum and Steel is a blog about the Apple Watch written by Alesh Houdek. Follow new posts on Twitter or with RSS.